Lately my kids have developed a taste for muffins. The chocolate chip variety to be exact. Since these seem to cost so much in the supermarkets (around £1 for four, which I personally think is extortionate) I decided to work out a tasty recipe for us to make together at home. As the title suggests, this recipe is foolproof! Each and every time I've attempted this recipe, the kids devour the muffins faster than I can say "wait for them to cool". Which, when you consider how fussy my son can be, is a rather great achievement! This recipe should provide enough batter to make 12 muffins if using the larger muffin cases, or 18 small ones if you only have cupcake cases to hand, and costs around £1.20 for everything (working out between 7p and 10 each muffin, depending on the size). Beat all of the wet ingredients together in a jug, then pour over the dry products in the bowl. Mix well until everything is combined. Divide your mixture between your muffin/bun cases, making sure each case is about 3/4 full. For extra special muffins, sprinkle a little brown sugar over each filled case (optional, leave out of you're worried about the sugar content!). Bake in your preheated oven for about 20 minutes, or until brown and risen. To be sure your muffins are cooked, stick a toothpick in one muffin and see if it comes out clean. Remove from the oven and leave to cool on a wire rack. Then try to hide the muffins or they may well disappear before you have time to try them yourself! 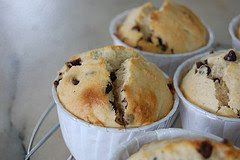 I love making these muffins, especially as these are so cheap to make! I've found these can store for up to a week when in a sealed container, and they also freeze well, so if you're short of time double up on ingredients, use an extra muffin tray and make some in advance. Image credit: wentongg, via Flickr Creative Commons.